Badhai Ho tackles a serious subject comically, without losing on entertainment or your attention, says Sudarshana Dwivedi. That love and physical relationships are the prerogative of the young, is an unwritten law. If it involves the elderly, it can only invite ridicule or wrath. Ridicule, if they are not related to you, and wrath, if they are your parents. As somewhere a character says in the film, you think of a mother as a goddess. You stop thinking that she is a wife and a woman too. The needs and desires of parents have been the subject of films earlier too. In Pyaar Ke Side Effects, the romance of Dimple and Rishi Kapoor angers their progeny, as it does the children of Shefali Shah, in the more recent Once Again, when she starts finding solace in Neeraj Kabi. Badhai Ho goes a step further as it tackles the tricky subject of middle-age pregnancy. How it affects the whole family, especially two grown up sons, forms the crux of the story. Not too long ago, it was not an unfamiliar scenario. My eldest brother-in-law was 20 years older than my husband and 22 years older than his youngest sister. There were many such families with vast age gaps between siblings. No one had heard of family planning and the family kept growing till the matriarch was fertile. But it does shock and jar in today's scenario when even the old grandmother knows about condoms and scolds her son for not using it and let his libido get out of control. She does reconcile with the news, but it takes much longer for the embarrassed sons to come to terms with it. Amit Raghvendra Sharma (with the eminently forgettable Tevar to his credit) is on a firm footing here. With a slice-of-life story, warm vibes, tight screenplay and pithy dialogues that entertain and a posse of dependable actors, Badhai Ho is a breeze. 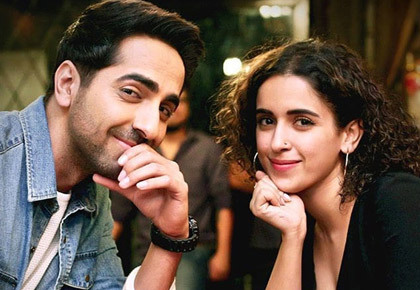 The role fits Ayushmann Khurrana like a glove. His mobile expressions, innocence and excellent dialogue delivery bring Nakul alive. He has proved himself so well in such situations (Vicky Donor, Dam Laga Ke Haisha, Meri Pyari Bindu) that he can now effortlessly bring such characters alive. Neena Gupta, always a dependable actress, is in full form and does complete justice to the meaty role. The surprise package is Gajraj Rao who conveys so much even in scenes where he does not utter a single word. Surekha Sikri, always a delight to watch, was doing so well before she decided to give herself an overdose of melodrama in a totally unneeded sequence. 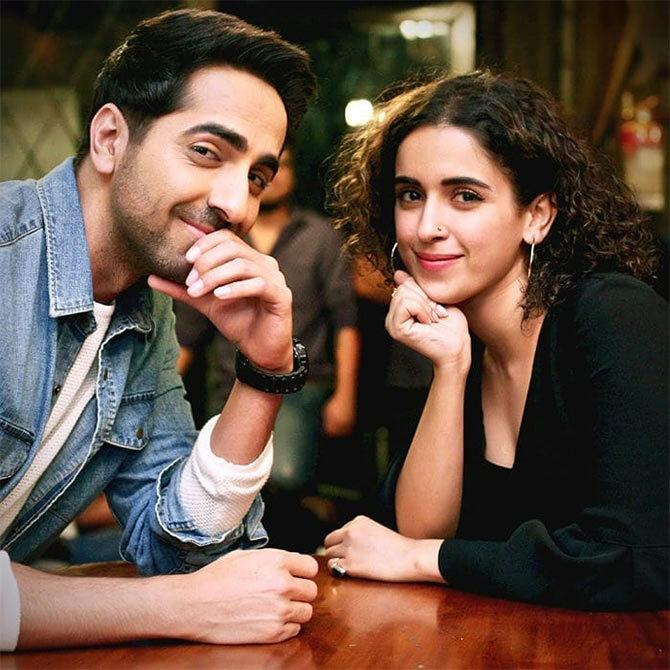 Sanya Malhotra has nothing much to do except look pretty, and that she does in a refreshing way. What I failed to figure out was the mishmash of Punjabi, Haryanvi and colloquial Hindi of Uttar Pradesh being spoken by the same characters -- is it the result of three writers working on it or something else?